During the 2006 renovation, concrete drive & sidewalks were constructed to flow to the front deck without steps. The exterior entry door opening to the mudroom was enlarged, as was the entry from the mudroom to the living room area. The door opening to the bath has also been enlarged, and a lower cabinet in the kitchen removed for better accessability there as well. 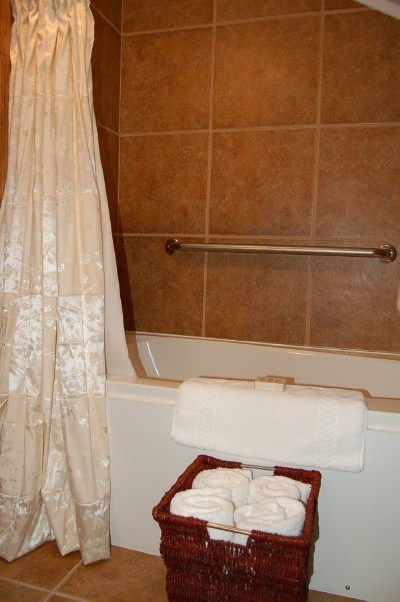 The bath tub and toilet each have a grab bar mounted for easier use. The living room has a futon that is easily converted to a full size bed. 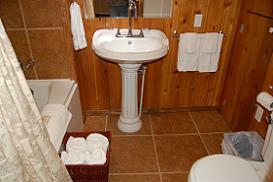 On the lower level there is a small step from the living room to the bath. Not as accessible: The main bedroom retains its original 1923 constructed smaller opening, and has a small step as well. The other two bedrooms are accessed by a ladder and a staircase. The hot tub is accessed by steps. 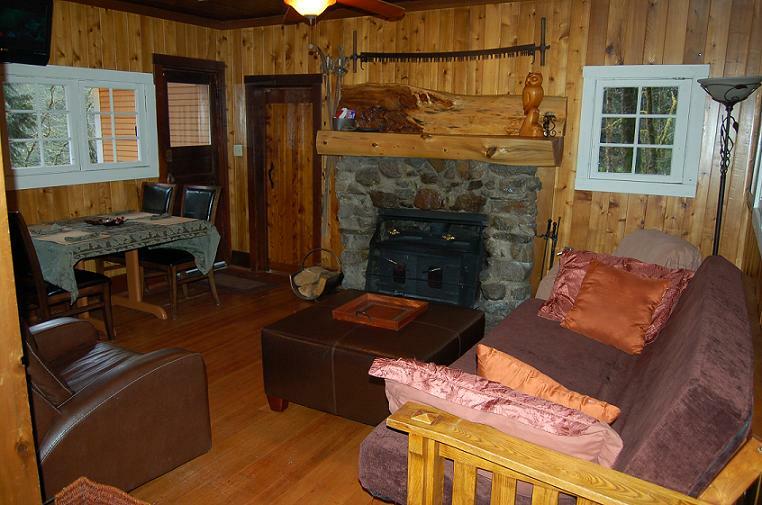 The living room has a cozy old stone fireplace with woodstove insert, and a custom built beautiful rough sawn cedar mantle constructed from one of the windfalls. The old rustic fir floors have been refinished, flaws and all. 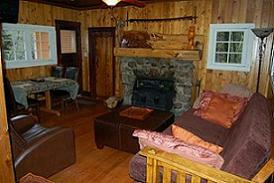 There is a comfy reading area right beside the fire, with a small collection of books for your enjoyment. If you prefer to watch movies, there is a flat screen TV and VCR/DVD player with a large collection of videos for your entertainment. The futon sofa easily converts to a full size upgraded memory foam bed! 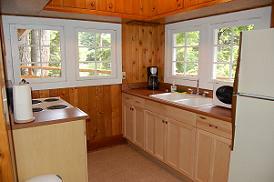 This fully remodeled Kitchen with new countertops, sink and base cabinets. 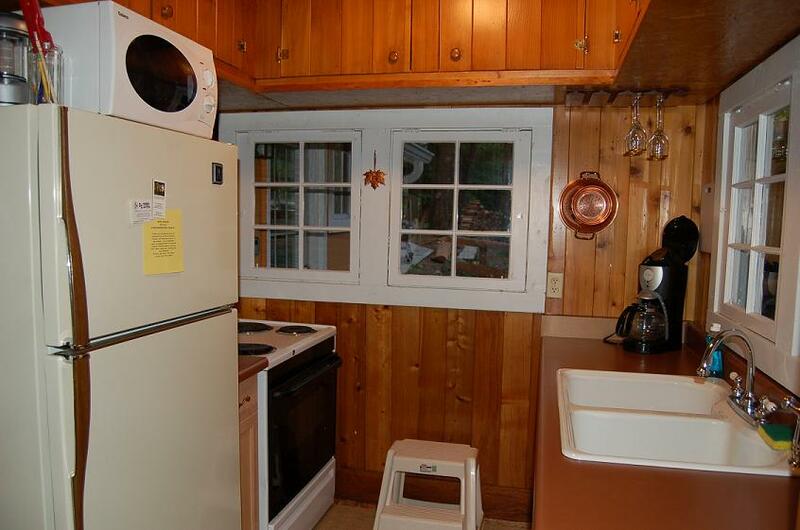 Available for your use are a microwave, newer glass top range and full size refrigerator. The cabinets are stocked with a coffee maker, coffee grinder, belgian waffle maker, corkscrew, pots, pans, dishes, cups, glasses and silverware for your use. Complimetary coffee, tea, hot chocolate, hot cider, microwave popcorn, waffle mix, and syrup are included. Here you will find a full size oak table with 4 comfortable chairs. The chairs are highbacked and leather covered with thick padding on the seat and back. The dining table is covered in a cloth tablecloth. For additional seating You will find 4 padded folding chairs and an extra table leaf in the entry closet. 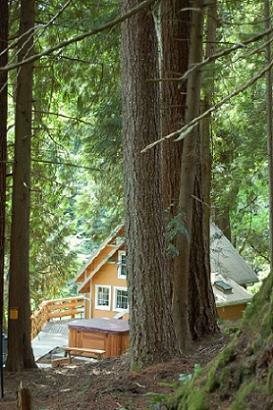 Enter through the original rustic door, to a beautiful view of giant old growth trees out the west window, with more great views out the south window as well. This queen sleigh bed faces the windows for the tranquil view. 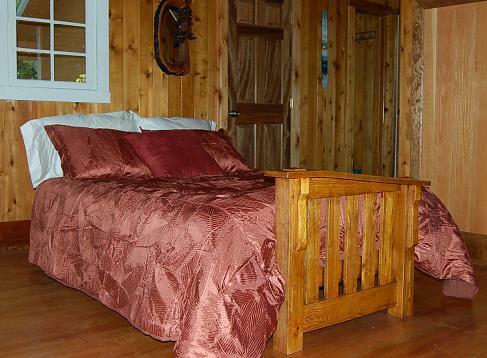 This roomy bedroom is right off the living room with rustic refinished fir flooring. 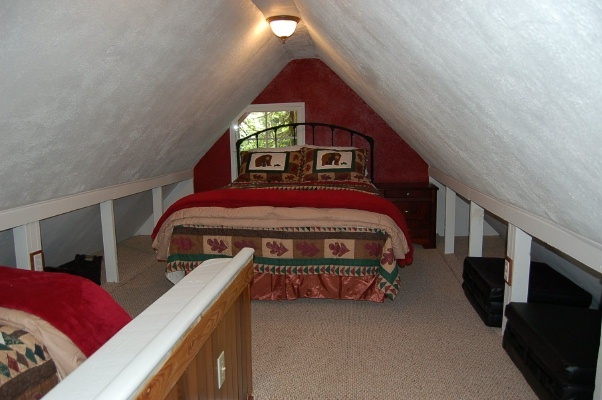 The Bear Cub Room, has one roomy queen bed and one comfy single bed in this upstairs bedroom. The cubby holes along both sides of the room, contain baskets with some board games, a small assortment of toys, extra books (including area hiking books! ), and extra floor pillows. The room has wall to wall carpeting. Due to the open staircase, this room may not be suitable for small children. 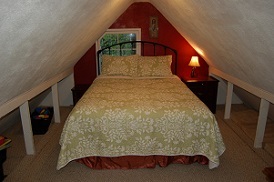 In the Owl's Roost sleeping loft, there is an additional comfy single bed. 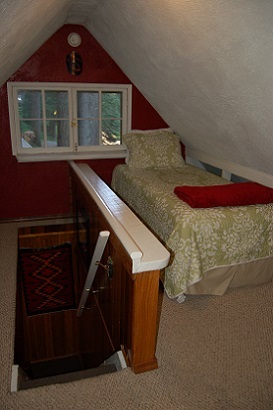 This room is accessed by a beautiful handmade fir ladder of oversize, heavy duty construction. Check out the view from this window! Deer like to ramble on this end of the house. 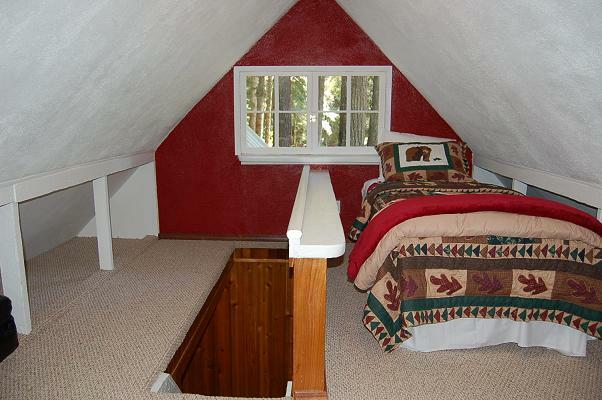 This room may not be suitable for small children due to the open loft construction. 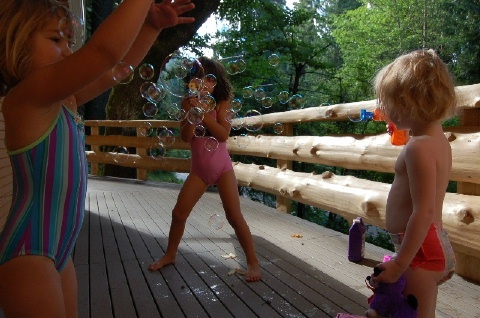 Located beneath the old growth trees, is a luxurious hot tub with a view of the forest, the wandering deer, an occasional raccoon and other small wildlife. The beautiful slab cedar railed front deck has lounge chairs for your resting pleasure and a BBQ. In the yard, there is a picnic table near the marshmellow roasting area, plus a horseshoe pit and hand made cedar slab dart board! There are two queen beds and each are covered in luxurious 600 thread count pima cotton sheets. 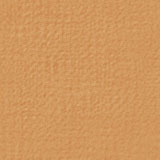 The full size futon has soft 400 thread count egyptian cotton sheets. Plus there are two twin beds covered in comfy 300 thread count cotton sheets. 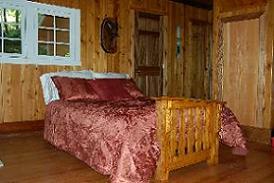 Every bed has cozy soft blankets in summer, electric warming blankets in winter, plus warm comforters or colorful quilts. 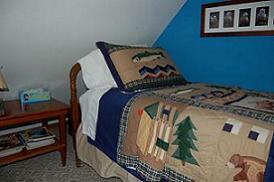 We replace our bedding often so sometimes the photos do not match the new quilts. 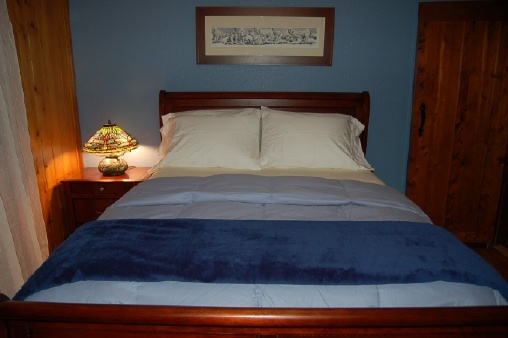 All beds have extra thick mattress covers, plus the single beds have memory foam toppers for additional comfort. 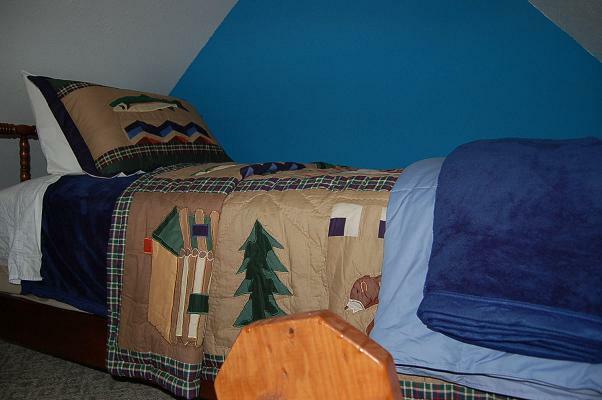 There are also extra pillows and blankets for each bed.